a new delhi, india based company specializing in preventive care of distribution transformers. Delhi, India-based company offering services for films, serials, shows, and albums. Offers also composition specially focused on meditation, healing, trance, spiritual, and reiki. German Translation Services in New Delhi India. Company based in New Delhi, India, focused on both languages. New Delhi firm provides details of projects, portfolio and clients. Vegetable seed producer, with bases in Delhi and Srinagar. New Delhi based company has operations for on-line detailing and drafting via Net. Translation in all Indic languages. Company based in New Delhi, India. 10 patriot international delhi, india. delhi, india. manufacturer and exporter of lehengas and salwar kameez. Provides data entry, conversion, processing, and capturing services. Showcases of pen and ink illustrations, graphic designs, and photographs. New Delhi, India. route maps, travel tips, and construction projects described. Offers product, textile, apparel and web designing. offices in New Delhi and Mumbai. Independent commercial portal, devoted to the citys building construction industry. Provides a wide range of prepress and e:publishing services in the U.S. and New Delhi, India. Includes products, services, and techniques. Located in Delhi, India. Manufacturers of emulsifiers for the confectionery and bakery industries. Headquartered in New Delhi, India. Resume lists details of programming experience and projects on Windows. Delhi, India. manufacturers and exporters of stainless steel utensils, kitchenware, and tableware. new delhi, india. Manufacturer of gear components and transmissions, specialising in tractor parts. Delhi, India. manufacturer of double and childrens beds, couches, chairs, and handicrafts in new delhi. Exporter of compressor spares, air dryers, and related equipment. Delhi, India. Services in architecture, interiors, exhibitions and multimedia. Offices in Delhi, Chennai and Pune. Web site design and multimedia services. Portfolio, service listing, and contact page. New Delhi. New Delhi-based firm providing architecture, interiors, landscape and planning services. manufacturer and direct distributor of glass, acrylic and wooden awards, based in new delhi, india. based in delhi, india. offering forwarding, customs clearance, and packing services. Delhi, India based commercial HVAC and refrigeration contractor offering design and manufacturing capability. Based in New Delhi, India. Specializing in food styling and prop coordination for advertising, editorial, and film. Exporter of Indian spices, with details of products and ingredients, and list of international distributors. New Delhi, India. Manufacturer and exporter of Indian ethnic sweets and related food products. Based in New Delhi, India. providers of solutions in intranet, e-procurement, reseller management, crm, website design, and hosting. based at new delhi, india. Manpower recruitment consultants with headquarters at Chennai and associate companies at Bangalore, Bombay, Hyderabad and New Delhi. offers custom built e-business solution and embedded solutions using java and .net technologies. based at new delhi, india. manufacturer of natural ayurvedic skin and hair care products. located in new dein new delhi, india. Milling, processing and exporting of Basmati rice, pulses and tea. Company profile, products and photos of facilities. New Delhi, India. a new delhi-headquartered nvocc and mto engaged in global freight forwarding both by air and sea, and international consolidators. Specializing in digital/Photoshop created imagery. Automotive, product, and corporate photography. Located in New Delhi, India. Transcription, data conversion, and other document-related services. Offices in West Hills, California and Delhi, Chandigargh, India. offering cargo, passenger, and ramp services, along with maintenance and avionics support. located at the igi palam airport, new delhi. route maps, travel tips, commuter information. also includes future plans and construction projects. Distributors for INA, OZAK, STIEBER, TSUBAKI, and IKO brands of bearings and linear motion products, based in Delhi, India. indian forwarder with offices in new delhi, tiruppur, coimbatore, moradabad, badohi, mumbai, chennai bangalore and calcutta. Manufacturer of feed grinders and mixers, rice mills and polishers, and woodworking equipment. Located in Punjab and Delhi, India. A firm of Chartered Accountants in Delhi, serving since 1980 with services including auditing, tax, regulatory norms and others, to Indian and international clients. Manufacturer and exporter of high pressure laminates. Based in Delhi, India. Provides numerous data processing services, along with web solutions and graphics services. Consultancy firm for the food processing industry. Located in New Delhi, India. Private detective agency based in New Delhi. Private detective agency based in Delhi. new delhi based exporters of shawls, sweaters, tassels and purses. also, collections of handicrafts. manufacturers of water, and stick-on tattoos. on-line shopping. A web site and print design firm based in New Delhi. Includes pricing and work samples. Advertising agency in New Delhi, India. We undertake almost any sort of advertising business (outdoor, print and electronic media). Firm providing photography, animation, interactive and print design. Includes contact form. Based in New Delhi. New Delhi firm offering architectural design, interior design and project supervision service. Cadence tool for printed circuit board design. Provides photoplotting services and pcb prototyping services. New Delhi, India. offering consulting for quality awareness and conducting iso audits for assessment. also offering regulatory conduct communication workshops in new delhi. sources and exports furniture, textiles, handicrafts, furnishings, giftware, and home decor products. new delhi, india. Developer and supplier of TETRA systems and terminals for military, public safety and other mission critial uses. Provides design services for websites, logos and print materials, CD-ROM design and development and content writing. Based in New Delhi. subcontract, outsourcing, and repair of electromechanical devices, specializing in automotive switches and injection moulded parts. new delhi, india. Third party BPO services provider located in New Delhi. Specializes in mortgage telemarketing and also offers customer support, collections, and survery services. freight forwarding, trucking , warehousing, customs services company providing logistics solutions in new delhi-india. Manufacturer and exporter of a wide variety of sprayers including hand, knapsack, foot, and stirrup. Includes product details and photos. Headquarters in New Delhi, India. Processors of herbal extracts, essential oils, herbs and raw materials used in pharmaceutical, health, cosmetics, food and perfumery industries, for export from Delhi, India. New Delhi based software professional. Involved in software engineering and various stages of software project life cycle. helicopter charter service, based at bangalore, services also from delhi, mumbai, chennai and hyderabad. for corporate charters, helitourism, medical evacation, offshore oilfield logistic support and helitours. Services include website design, print design, prepress, artworks and multicolor printing. Includes portfolio and contact details. Based in New Delhi. offer software development services, focused on web application design, development and hosting. based in delhi, india. A firm in New Delhi, India, offering 3D modeling, rendering, graphics, illustration, walkthrough/animation and logo design. New Delhi full service firm. Includes firm history and services. offers airport enquiry, international and domestic airlines and information about delhi. contains information about international and domestic flight schedules and related information. India. Annual conference for manufacturers, suppliers and importers of textiles, clothing, textile machinery and allied products, organised by the Confederation of the Indian Textile Industry. New Delhi. December 1-2, 2005. An independent marketing services agency with offices in Mumbai, Delhi and Bangalore. manufacturers and exporters of frame tents, round tents, relief tents, medieval tents and camping equipment. located in new delhi, india. Trade fair for manufacturers and traders in jute fiber, yarns and finished products. New Delhi. Februari 25, March 1, 2005.
International exhibition and conference for the labeling and converting industry. December 3-6, 2004 Pragati Maidan, New Delhi, India. Dairy cattle sales including select herd, college, milking herd, consignments, dispersals and ETs. Located in Delhi, New York, USA. Translation in Russian and English, based in Delhi, India. Expertise in research based writing, interactive scripts for CBT, WBT products, instructional design, and content for children fiction/non-fiction. Based in Delhi, India. Manufacturers and exporters of carbon, black, ERW galvanised pipes and tubes, plain end casing pipes, as well as cold rolled sheets and coils. Delhi, India. New Delhi-based architects, engineers, interiors designers and urban designers offer information on projects and principal partners. New Delhi manufacturer and exporter of gears, gear shafts, fly wheel ring gears, steering shafts and other parts for agricultural tractors. full service firm based in calcutta india. offering world wide services to and from india. branch offices in delhi and mumbai with agents throughout the world. on line shipping tools and contact information. Shanti Consulting offers cross-cultural training for effective communication between India and her business partners. Based in Indianna and New Delhi. Has information on team, programs and cultural situations. Public relations firm based in New Delhi, India provides reputation, crisis and brand management, investor and corporate communications, event promotion and market research. Offline and Internet based capabilities. Includes company profile, services, advisory board, clients and contact information. new delhi, india ee. new graduate, c.c.s. university, meerut, india and university of glasgow. uk. class project: fiat brava inverter and power steering. qualifications, work experience, skills, strengths, personal, hobbies of jasmeet kaur (electrical engineer). Cultural and ethnic dance costumes imported from Cairo and Delhi. Cultural and ethnic dance costumes imported from Cairo and Delhi by a UK based company. New Delhi, India based concern, engaged in exporting of smoking articles and incense sticks and cones. Specializes in figures by Britains including the Civil War, Delhi Durbar, Rorkes Drift, Knights, and Napoleonic series. Delivery of arrangements and gifts on a same day basis to New Delhi and surrounding areas via a franchise network. Includes national and worldwide order transfer service. Hindustani, Carnatic, devotional, sufi, folk, regional, wedding songs, and new age music CDs and cassette tapes. Based in New Delhi. Supplier of Indian classical and folk musical instruments, including harmonium, sitarm tabla, shenai, shruti boxes, and dholak. New Delhi, India. C-2 team, member of the Delhi Athletic Associations and based in Cincinnati. Includes team and player photos, schedule, and videos. Exotic animal hunts in Delhi, Texas. Information on the services provided by this Delhi, India company. Dr.Munish Paul, M.D presents his practice, New Delhi, India. The site lists curriculum vitae / bio-data of Dr. R. R. Kapur of Delhi. Teaches WTF-style in Delhi. Has photographs, syllabus, forms and principles. Urvashi Puri offers healing services in New Delhi. Contact form. New Delhi based club. Class details, instructors and gallery. Based in India. Site includes treatment details, clinic facilities and risk factors to consider. Pictures, breed standard, pedigrees, show news, and litter announcements. New Delhi, India. Airfares to Mumbai, Chennai, Bangalore, Hyderabad, Delhi, Kolkata and all major cities in India. New Delhi doctor offers medical and surgical abortions, as well as general gynecological and obstetric care. Based in New Delhi, India. Site contains HIPAA compliance statement, pricing, reviews and contact information. India, Delhi, standing two stallions. Includes stallion details, progeny and race records, statistics, news and contacts. Dr. Sanjay Dhawan providing information on laser technology, eye conditions and diseases, procedures offered and a section devoted to medical students. NA meeting lists and contact information. Gives meetings in other parts of India as well. Offering tandem flights in 3-axis ultralights. Located in Delhi, India. Deals with medical emergencies, evacuation, rescue and assistance. The organization located in New Delhi also has braches in Goa, Mumbai and Nepal. Located in Delhi. Provides a classifieds section, mailing list, pictures, songs, and upcoming hash details. New Delhi, India based agent specialists in wildlife, eco tours, and birding tours. Includes itineraries, and enquiry form. The camp is for 2nd - 12th grade basketball players looking for a weeks worth of basketball training in a competitive, yet fun and enjoyable atmosphere, located in Delhi, New York. Offers information on criteria for transplant, liver care, alcohol and the liver, and liver tumours. Part of the Sir Ganga Ram Hospital, New Delhi. Affiliate of the Pranic Healing Foundation of Delhi, India. Courses and healing sessions offered. Stock status of blood components (whole blood, plasma, fresh frozen plasma, red dell doncentrate, platelet concentrate, cryoprecipitate, albumin). Donor can register their requirement on web site. Offers information on criteria for transplant, liver care, alcohol and the liver, and liver tumours. Includes Indian laws governing transplant, surgical procedures, patient information, and virtual tour. Part of the Sir Ganga Ram Hospital, New Delhi, India. New Delhi, India school for skills of beauty therapy, hairdressing, cosmetology, aromatherapy, holistic treatments, professional makeup, personal grooming, mehndi design, mehndi tattooing, bridal makeup, nail art and salon management. Approved by The City and Guilds of London Institute. Offers design, hosting, and promotion. Based in New Delhi, India. Offers website optimization, design and hosting. Delhi, India. Resume of web designer and programmer. Located in New Delhi, India. Web design, marketing and promotion services. Based in New Delhi, India. Offers optimisation and link building services. New Delhi, India. Services in web hosting, web design and application development. Delhi, India. Offering design, promotion, and electronic catalogues. Based in New Delhi, India. IBM India Research Lab, New Delhi - Multimodal Speech Recognition, Image Processing. Provides search engine optimization, web design and reciprocal link building. New Delhi, India. Offers web design and programming, animation, and web promotion. Based in New Delhi, India. Web design and search engine optimization company based in Delhi, India. Provides design, hosting, optimization, and development. Locations in Delhi, India and Cardiff, United Kingdom. Offers web and multimedia design, branding and e-learning services. Janakpuri, New Delhi, India. Provides web site promotion, optimization, search engine submission and ranking services. New Delhi, India. CD authoring, web design, and screen savers. Based in Masjid Moth, Greater Kailash, New Delhi. Provides web and multimedia design and development services from Delhi, India, including Flash, and digital business cards. Offers design, shared hosting, site submission service and domain registration. Located in New Delhi, India. E-commerce and web developers, in North Delhi, India, includes, hosting, portals, application and software development. Web site design, Flash animation, e-commerce, and database development for businesses or organizations. Based in Delhi. Offers web hosting, design, multimedia, application development, network management, and consulting. Located in New Delhi, India. Providing web site design, renovation, e-commerce, portal management, and web promotion. Located in Delhi, India, and Chicago, Illinois. Offers web site design, online marketing and promotion, and other e-commerce, creative designing services. Based in Delhi, India. Web and graphic design, hosting, application development, and e-commerce. Includes services, portfolio, and vacancies. Located in New Delhi, India. Provides Linux training and services in New Delhi, India. Course details and links to Linux resources. Web design and development, e-commerce applications, software development, and content management. Located in Delhi, India. Content management systems, graphic design, promotion, and corporate branding. Located in New Delhi, India. Software company in Delhi, India, includes web design, portals, multimedia, CBT development, hosting, online promotion, NT, Lynux, server maintenance, Flash, and IT consulting. Consultants and system developers in the field of bar coding including Basawa bar code labeller and software. Based in New Delhi, India. Offers design, re-design, maintenance, flash presentations, e-zine publication, translation services and banners. Based in New Delhi, India. Design, e-commerce, search engine registration, and consulting services. Also offer e-learning, telecom, and testing services. Based in New Delhi, India. Offers web design, Flash, CD authoring, programming, 2D/3D animation, and print design. Offices in New York, United States, Melbourne, Australia, and New Delhi, India. Offers design, consulting, e-commerce, databasing, media presentations, and search engine submission and promotion. Competent in Cold Fusion and Ultradev and Dreamweaver. Located in Delhi, India and New Jersey, United States. IT services incluinge CD presentation, CBT, school management software, real estate software and BPO services, and Flash, Director development. Based in Delhi, India. Offer services in print, web and multimedia, corporate identity design, strategic consultancy, brand building, 3D animation Flash, multimedia presentations, e-commerce, datbase management, and web hosting. Located in Pitam Pura, New Delhi, India. Meets on the 2nd Monday. Officers, newsletter, calendar, contacts, links and Masonic forms. Website of ISKCON Youth Forum at the Glory of India Sri Sri Radha Parthasarathi Temple in Delhi, India. law firm, located in new delhi. february 15, 2002 - new delhi, india. general practice law and consulting firm based in new delhi. Jewelry, trinkets and tools for your magickal needs. Located in Delhi, NY. 176 Delhi Bible Fellowship Gurgaon, India. Gurgaon, India. English and Hindi worship services. New Delhi architect in Vastu based design - summary of projects done and CAD solutions. India has long felt the bitter hurt of terrorist attacks on civilians. Chartered accountant from New Delhi, India. RÃƒÆ’Ã‚Â©sumÃƒÆ’Ã‚Â©, cartoons, optical illusions, favorite links. Argues that an Asokan Pillar at Delhi is an altar of Alexander and that an Indian conspiracy assassinated him. Sterling silver, pewter and gemstone jewelry plus spell and ritual supplies. Free shipping available in USA. Located in Delhi. services for international trade, including anti-dumping, duty, subsidies, and rules of origin. offices in new delhi and jaipur. personal injury firm with offices in binghamton, oneonta and delhi. An account from the British side by Lord Roberts, of the first weeks of the siege during May and June 1857.
rahul bedi in new delhi. the connection between pakistan and the kashmir militants. Chapter history and list of founding fathers and pledge classes. An extract from the Babur Nama (translation by Annette Susannah Beveridge, 1921) where the first Mughal emperor chronicles his conquest of Delhi and Agra. Website of Amiyo Devienne, who is leading several seminars internationally: London, Madrid, Rome, Sicily, Munich, Nurnberg, New Delhi, Dharamsala in India, in Moscow and St Petersburg in Russia. The Mar Gregorios Orthodox Christian Student Movement site in the Dehli Diocese. Information on activities, pictures and about the Mar Thomas Church in India. Celebrating one world of meditation. An online eZine based in New Delhi, India offering a listing of events and related news from the Indian press. Magazine published by Institute of Vedic Astrology, Delhi. Sample articles available on line. provides biographies of staff and attorneys, details of monthly discussion group related to issues and education in the capital district. other services at offices in albany, delhi and saratoga springs. this is the home page of sameer nagi. this site provides all the information one may be seeking about sameer nagi, a 22 year old punjabi boy from delhi, india. Osho World is an organization based in New Delhi, India that organizes meditation camps, exhibitions and publishes an online magazine, all related to the teaching of the mystic Osho. An indigenous independent missionary organization in New Delhi is involved in evangelism, church planting, missionary training, Christian book publishing, and social programs. Features facts about India and sponsor a child or missionary. Manufactures and exporters of harmonium, tabla, sitar, tanpura, sarod, dholak. Based in Delhi, India. fairly large selection of contemporary indian art. New Delhi-based Kathak disciples of Guru Jitendra Maharaj of Varanasi Gharana. New Delhi based photographer covering fashion, nature, travel, portrait, creative, religion, and dance. profile, details of performances, photographs, and audio clips of the hindustani classical vocalist based in delhi. contemporary new delhi surrealist explores metaphysical questions. includes images, biographical and exhibition information, and reviews. one of the leading art galleries in new delhi, featuring works of art by famous contemporary indian artists such as manjit bawa and m.f.hussain. Designer based in New Delhi, India. Downloadable resume and personal profile, as well as projects in industrial, web, graphic and multimedia design. designs, handcrafts, and plays percussion and wind instruments. offers presentations, events, and teaching sessions in the delhi, ontario area. a new delhi, india based artist with a versatile range of artwork including photography, sculpture, videos, photo performances, and installations. Makers and retailers of musical instruments. Includes online catalogue. an international refereed journal of english studies from the house of atlantic publishers and distributors, new delhi. involved in the promotion of childrens music activities for learning and performance. based in new delhi, india. site includes mission statement and project information. Manufacturer and wholesaler of Indian ethnic instruments. Percussion, string, rhythm, wind and electronic instruments. Located in Delhi, India with an additional showroom in Gurgaon. Probably the greatest Kathak exponent of our time, Birju Maharaj retired from Kathak Kendra in New Delhi, India in Summer 1998.
urdu/hindi qawaalis by amir khusro, a 13th century sufi poet from delhi. the lyrics are provided in urdu font (gifs), as well as in transliterated and translated forms. A site on The school which also features Jayalakshmi Eshwar (who trained under Rukmani Devi,) and has also learnt Odissi in New Delhi, India. The school wants to propagate Indian Culture and Art for disabled children. They also have links with a dance school in Texas, USA. SiteBook Delhi City Portrait of Delhi in Colorado. 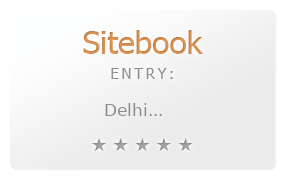 This Topic site Delhi got a rating of 3 SiteBook.org Points according to the views of this profile site.